When used with hand winches, this cable makes pulling and lifting a simple. Our hand winch cable is the perfect addition to your hand winch. It makes pulling easy. Give our hand winch cable a try with your winch. Its proven to make pulling easier. Our 8mm hand winch cable is a great compliment for your handwinches. This Winch Cable With Self Locking Hook Is Perfect For Use With Winches To Aid In Vehicle Recovery. Galvanised Winch Wire Rope With Swivel Autolocking Hook Is A Great Value Replacement Wire For Your Winch. 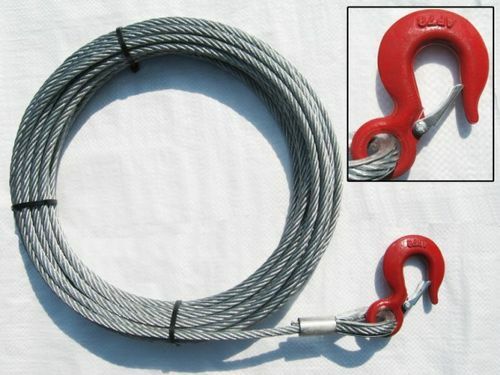 This Galvanised Winch Wire Rope With Swivel Self Locking Hook Is Ideal For Use Alongside Winches In Vehicle Recovery.